Literature / Make Room! Make Room! Make Room! Make Room! 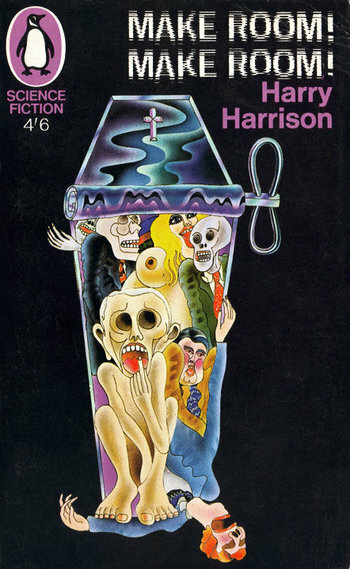 is a 1966 Science Fiction novel by Harry Harrison. It takes place in the Crapsack World of New York City in the (then) far-future year of 1999, beset by overpopulation and environmental collapse, where a bland artificial food called soylent (made from soy and lentils) is the best thing most people ever get to eat. When a wealthy racketeer named "Big Mike" is killed, NYPD detective Andy Rusch is assigned to investigate the murder—a daunting task, in a city of 35 million inhabitants. Rusch finds himself getting romantically involved with the dead man's concubine, Shirl. Meanwhile, the killer—a poor immigrant boy named Billy Chung—attempts to elude capture. 20 Minutes into the Future: The book was written in 1966 and set in 1999. Crapsack World: In addition to the everything crapsack-y about the movie, the transportation system has completely broken down. In other words, everyone is trapped in the city; the only non-human-powered vehicles mentioned are old buses taken from a history museum, used by the police and running on extremely low grade fuel. "Double, Double" Title: The title is formed by duplicating "Make Room!" Eat the Dog: "Leg of dog" is one of the rare delicacies offered at a black-market butcher shop. The End Is Nigh: A secondary character is Peter, a defrocked priest turned hermit who's eagerly awaiting the turn of the millennium, which he assumes will bring the end of the world. Excited Show Title! : The title is an exclamation, referencing the overpopulation of the world in the novel. Failed Future Forecast: The novel's "overpopulated" dystopia has a world population of around seven billion—a number surpassed in the early 2010s. New York City has yet to pass the nine million mark even two decades past when the book is set, never mind thirty five million. Future Food Is Artificial: Soylent steaks made of soy and lentils are an expensive item. Gaia's Lament: Earth's fate as a whole. Global Warming: Barely a page goes by without someone complaining about the ever-present humidity... in New York at winter time. New Year Has Come: The novel ends shortly after midnight on January 1, 2000. Not His Sled: An unusual example thanks to Adaptation Displacement. Soylent green actually is just processed soy and lentils. Only Electric Sheep Are Cheap: Even soy-based faux steak is expensive and worth practically rioting over. Overpopulation Crisis: The central issue which is destroying society in the book. Post-Peak Oil: Cities effectively become their own totally isolated city states when the oil becomes too rare to use. The only form of long-distance transport mentioned are large freighters (shipping food to the millions effectively trapped in cities); on the local level, motorized transit has been replaced with human-powered "pedicabs" and "tugtrucks". Sci-Fi Writers Have No Sense of Scale: As previously mentioned, apparently Harrison couldn't imagine a world with 7 billion people (more than double the world population of 3.4 billion at time of writing) not having all the problems his book shows.